Based on Hildebrand solubility parameter (δH) theory, a novel organosolv pretreatment medium (OPM), 1-pentanol (80%, v/v)–water mixture with a δH value of 27.4 (J/cm3)−1/2, was discovered. 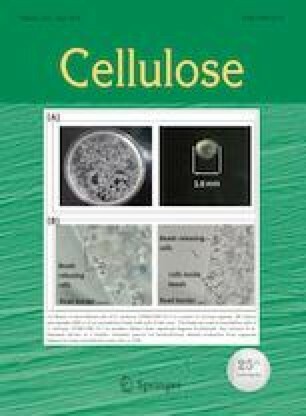 This OPM achieved near-complete removal of non-cellulosic components (hemicellulose 96.2% and lignin 87.8%) from bamboo under mild conditions [130 °C, 20 min, 4% (w/w) H2SO4]. For the OPMs with similar δH values [DMSO (80%, v/v)- and 1-pentanol (80%, v/v)-water, 30.9 vs. 27.4 (J/cm3)−1/2] to that of bamboo lignin [28.3 (J/cm3)−1/2] used in this study, the effect of the δh value (contribution of hydrogen-binding force to the δH) on lignin removal was also discussed. After overcoming the negative effect of lignin deposits on enzymes with biocompatible soy protein (SP), a decent cellulose enzymatic conversion (EC) of 92.6% was achieved by 1-pentanol (80%, v/v)-water induced organosolv pretreatment at a low cellulase loading (5 FPU/g glucan). This cellulose EC was much higher than those of other OPMs (< 63%) with the δH values very different from that of bamboo lignin. Integration of organosolv pretreatment with an ideal OPM and enzymatic hydrolysis using SP as an additive can be thereby viewed as a viable way to achieve the robust cellulose EC at low enzyme loading, which shows great potential for improving the economics of organosolv pretreatment-based lignocellulose biorefinery. The online version of this article ( https://doi.org/10.1007/s10570-019-02334-y) contains supplementary material, which is available to authorized users. This work was supported by National Natural Science Foundation of China (Nos. 31870559 and 31300495), Fujian Provincial Department of Science and Technology (2018J01590; 2019J01387) and Scientific and Technological Innovation Funding of Fujian Agriculture and Forestry University (CXZX2017034, CXZX2017293, CXZX2017374, and CXZX2018004). We also thank Prof. Nairong Chen (FAFU, China) for providing the DSP.